Just two years ago, Los Angeles native Lauren Modery moved from West Austin to a house on the corner of 12th Street and Chicon Street in East Austin. Initially attracted by the “artistic and culturally rich neighborhood,” Modery says she has seen East Austin change within her 24 months in the area, as development attracts different businesses and tenants and pushes property taxes “through the roof.” “East Austin is a perfect example of a transitional neighborhood. We live near individuals who've lived here for decades, young families, the upper-middle class, people on public assistance, hipsters, creative entrepreneurs and flop-houses. This is what makes East Austin so special, but I fear that many of the dedicated residents and folks on assisted living are getting pushed out," Modery explains. The East Austin Conservancy, a non-profit that represents the needs of the East Austin community, reiterates Modery’s concerns in a report on home ownership trends in East Austin. In a survey of data for several East Austin neighborhoods, the conservancy found that more than 90 percent of “long-time homeowners,” meaning any family who has occupied the same home for the past 20 years, have seen their land triple in value over the past 10 years. For these long-time homeowners, increased property taxes from the rising property values have made staying in the area difficult, says East Austin resident and president of the East Austin Conservancy, Raul Alvarez. “The rate of change and turnover in home ownership is pretty high, but it doesn’t mean we should throw our hands up in the air and do nothing," Alvarez says. Historically, East Austin has been a place for low-income families to thrive and create their own community. 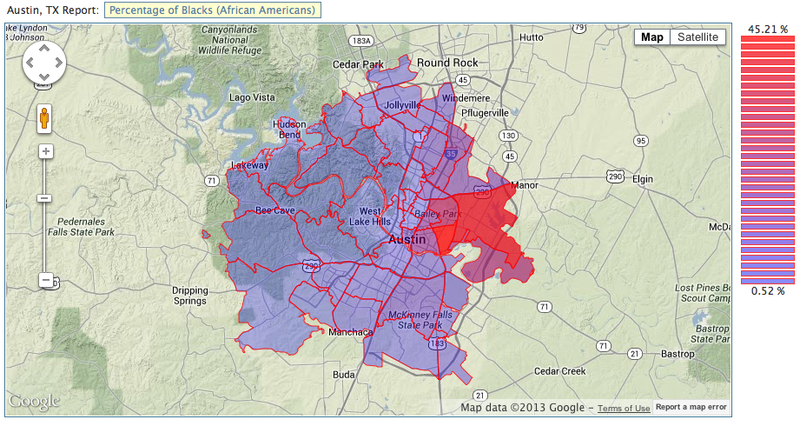 After the abolishment of slavery, minorities had to relocate to East Austin under segregation laws. For this reason, most of East Austin’s residents and long-time homeowners are either African-American or Mexican-American. Tim Pinson, the director of Mission: Possible!, a Christian non-profit that specifically serves East Austin neighborhoods, says that the home ownership turnover rates will increase East Austin’s risks of gentrification, meaning the displacement of poorer community members as the composition of the neighborhood changes. “Because of the way the situation is right now, with the ethnicity and racial profiling that goes along with it, the community gets into a socioeconomic spiral. It affects the families and their viability,” he adds. 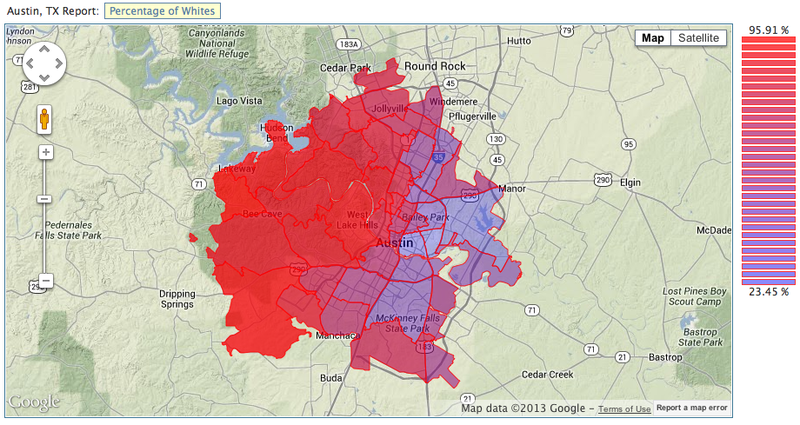 The following Google maps depict the current demographics in East Austin and West Austin. In the East Austin Conservancy’s report, the conservancy concluded that an average of 37 percent of the homes in East Austin neighborhoods owned by long-time homeowners had a different owner by 2012. Alvarez said that the majority of these long-time homeowners lived in affordable housing units, which are currently the most attractive properties for purchase in East Austin, according to the Austin Multiple Listing Service’s report. 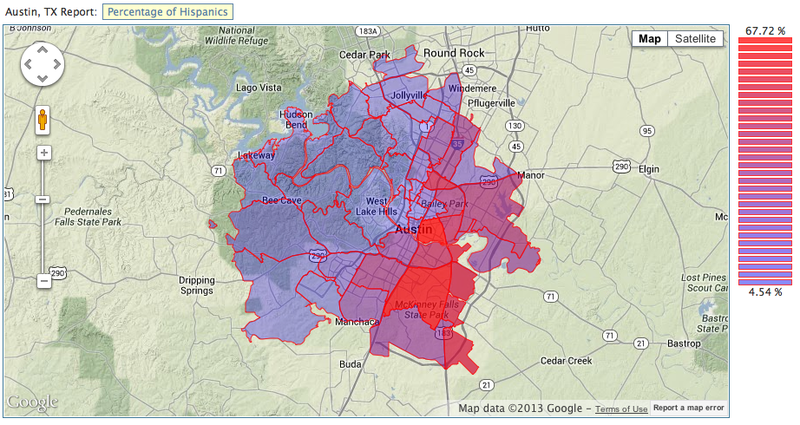 In the report’s assessment for 2012, more than 85 percent of the homes sold in East Austin were under $400,000. Since many of these homeowners survive on low incomes, Alvarez says the rising property values make it easy for the owners to sell the homes when property taxes become too high to pay. These families are then forced to move farther out of Austin, as the availability of affordable housing in East Austin has decreased with the recent influx of residents. “There’s nowhere in the central city that you’re going to find cheap housing. So, you’re basically going to have to move away from the central city and all of the programs that assist lower income families. That really lessens their quality of life,” Alvarez says. 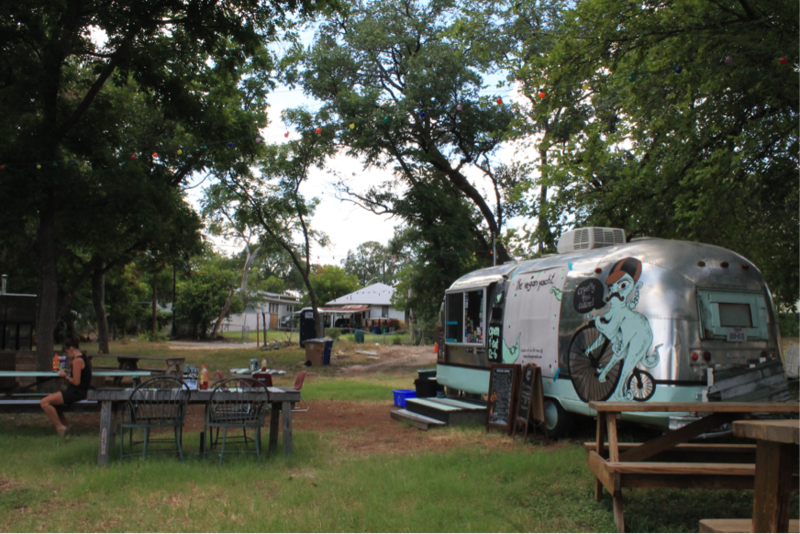 Although Modery does appreciate some of the new developments in East Austin, like high-end eateries and boutiques, she worries that it may become unaffordable to stay. “A small piece of me dies when I see a new coffee shop where the coffee is $3, or a food truck where the food is $12. It's becoming an area where only the upper-middle class, or upper class, can eat and hang,” Modery says. 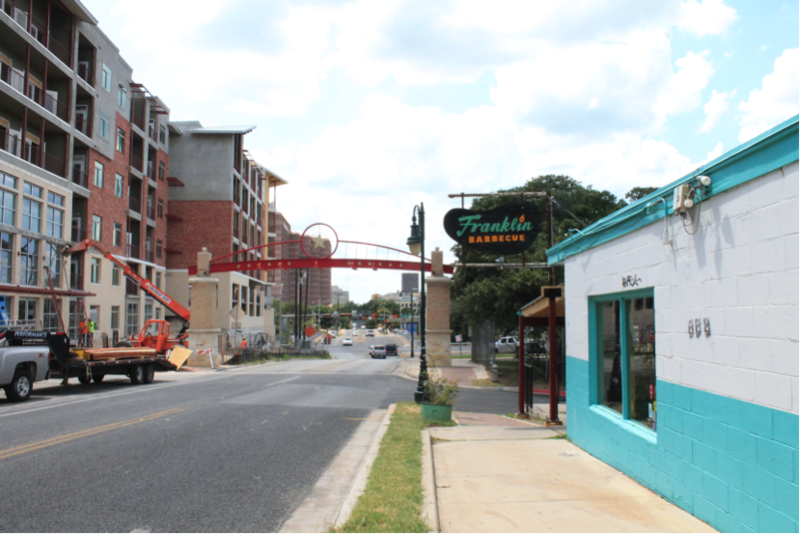 Because the development in East Austin has occurred quickly and little data has been collected about changes in the area’s economy over the years, no one has been able to surely predict an outcome for the situation, or find an agreeable solution for all parties. The city of Austin has attempted to create more affordable housing by building more affordable housing units, but this does not cover the amount of families displaced from their homes and only creates more costs for the city, Alvarez says. 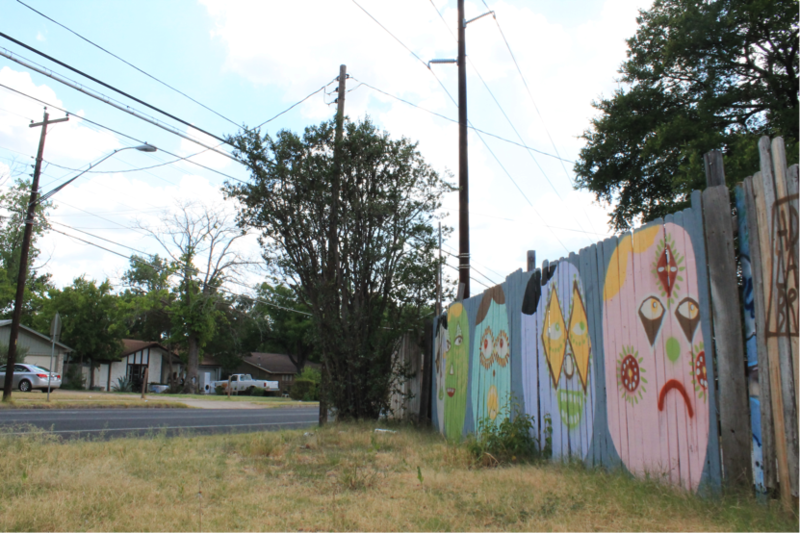 The East Austin Conservancy has tried a different solution by assisting long-time homeowners with their property tax payments through a matching program, but the program has only had 17 applicants and some of the homeowners have already sold their homes. Pinson suggests empowering the long-time community members to start businesses of their own, which would bolster the current development of East Austin, while also allowing the original community to stay in the area, maintain their cultures and keep their homes. He warns that this solution would take time, effort and cooperation from all sides. “I think any time things get going fast, there are innocent people that are hurt. How do you slow the process down in such a way that allows people to get caught up, so that we can actually create a solution? In a perfect world, you’d want to keep the old community as much as possible,” Pinson says.